When the Japanese attacked Pearl Harbor on Sunday morning, Dec. 7, 1941, Pvt. Stan Sherfick of Punta Gorda, Fla. was playing catch with a buddy at Haleiwa Field on the north side of Oahu Island, where the 47th Pursuit Squadron was based. “All of a sudden, while we were throwing the ball, the sky was full of airplanes. There were more airplanes flying over than I had ever seen in my life,” the 84-year-old said. “They were flying south toward Pearl Harbor. They were flying high enough that you couldn’t see the rising sun insignias on their wings. All hell broke lose. There was a lot of confusion, according to Sherfick. Pilots from his P-40 Tomahawk squadron began arriving back at the base about a half-hour after the enemy planes flew over the steel-matted runway at Haleiwa. “I was helping a guy named Smith arm a P-40 on the end of the runway. I was carrying ammunition to him when a Japanese dive bomber strafed the field and shot up the P-40,” Sherfick recalls. “I ran over to the edge of the woods out of the way. I got my 1903 Springfield (rifle) and shot at the attacking plane. The rumors were flying after the attack on Pearl. The soldiers of the 47th Pursuit Squadron dug foxholes and prepared for an invasion of Oahu, the main Hawaiian Island, by an enemy that never arrived. 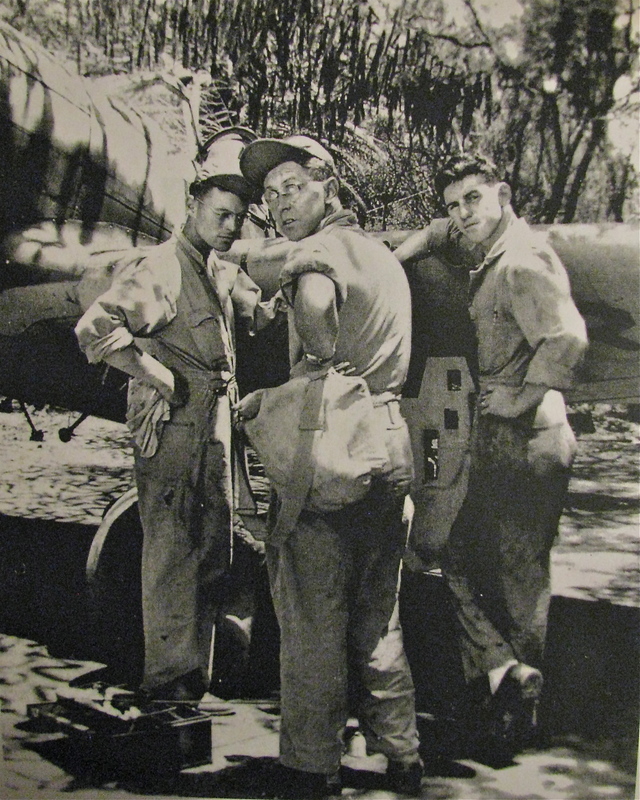 Sherfick (L) talks to a couple of his buddies working on a P-40 “Tomahawk” fighter plane. Sherfick eventually became a sergeant and an armorer. His job was to make sure the .50-caliber machine guns on the fighter planes in the 47th were operating properly and had plenty of ammunition. During the war the squadron’s primary mission was to train new pilots. They helped make them more proficient aviators before they went to the front as replacement pilots. Sherfick spent most of the war in the Hawaiian Islands. 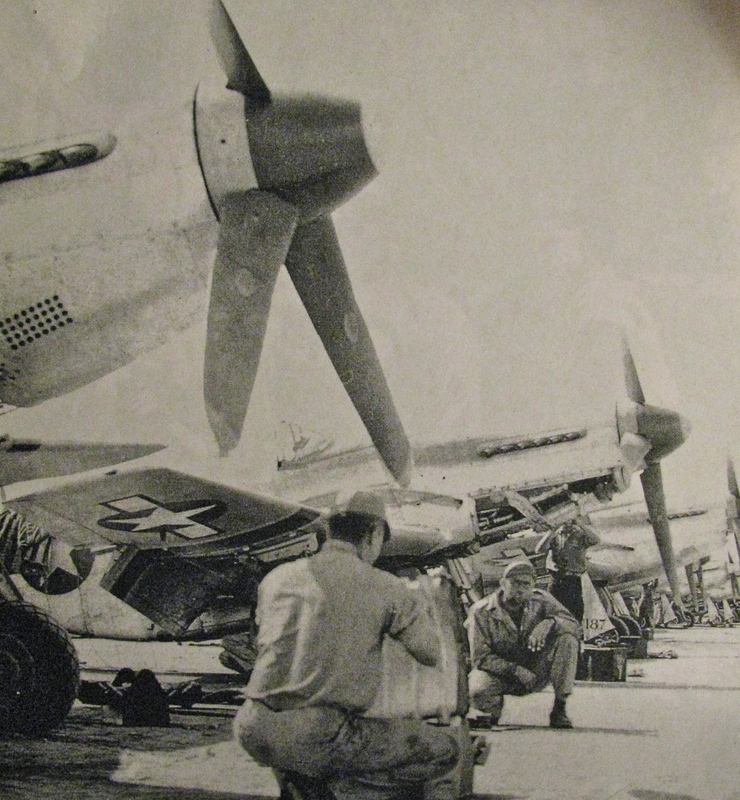 By 1942 the squadron’s outdated P-40 Tomahawks were replaced with the superior P-47 Thunderbolts. A couple of years later the 47th Pursuit Squadron was flying P-51 Mustangs — the Cadillacs of the air in World War II. Different fighter planes didn’t change Sherfick’s job much. They all had .50-caliber machine guns that had to be maintained and rearmed. That was his job. Finally, just before the attack on Iwo Jima in mid-February 1945, the 47th Squadron got new orders. It was to play a major role in the attack on Japan. It was to fly into the tiny speck of a volcanic island as soon as the Marines took one of the two airfields on the island. From there the squadron would fly cover for B-29 bombers that were pounding the Japanese home islands on a daily basis. Sherfick and 70 members of the squadron’s ground crew were aboard a ship just off the beach at Iwo Jima when the first wave of Marines hit the beach Feb. 19, 1945. A few days later the ground crew went ashore and set up shop at one of the runways built by the Japanese after the Seabees repaired the field. “The first night on Iwo Jima I was digging a foxhole and I dug up a big piece of human flesh. I’ll never forget that,” he said. “We dug in right next to a battery of 105s (howitzers). The next morning we were covered with volcanic dust. Our carbines were also covered with dust. Good thing we didn’t have to use ’em. Despite the incredible slaughter on both sides during the 36-day battle for the 8-square-mile island, Sherfick said he never saw a live Japanese soldier. He credits the U.S. Marine Corps for that. “The airfield was surrounded by the Marines. I have all the respect in the world for the Marines,” he said. Ten days after going ashore on Iwo Jima he got the word he had been waiting for. Because he joined the Army in September 1940, he had more than the 85 points needed to return stateside. “I was very happy about going home. I went to Saipan and caught a PBY (flying boat) to Christmas Island and from there to Honolulu. In Hawaii I boarded a liberty ship, and five or six days later we docked in San Francisco. It was shortly before V-E Day (Victory in Europe) and three months before V-J Day (Victory in Japan). Stan Sherfick of Deep Creek was in the Air Force a week shy of five years during World War II. His commendations for battles and campaigns include: Central Pacific, Western Pacific, Iwo Jima, Asiatic-Pacific Theater of Operations, three Bronze Stars, American Defense Service Medal and a letter of commendation for being in the Pearl Harbor attack signed by Brig. Gen. H. C. Davidson, Air Corps Commander. Stanley Lee Sherfick of Punta Gorda, Florida, Age: 88, passed away on Tuesday, July 15, 2008. Born September 10, 1919, son of: Everett and Anna B. Sherfick both deceased, in Shoals, Indiana. He was husband of Patricia Sherfick, Punta Gorda, Florida, and father to a daughter, Geneane Lee Donald Kinnett, of Fairland, Indiana and to a son, George R. Emalie Sherfick of Terre Haute, Indiana. He is survived by three brothers: Howard Blume Sherfick of Shoals, Indiana, Gene Eldean Sherfick of Shoals, Indiana and George S. Jewel Sherfick of Terre Haute, Indiana. Other family members include 6 Grandchildren 1 deceased and 13 Great Grandchildren 4 Great-Great Grandchildren. 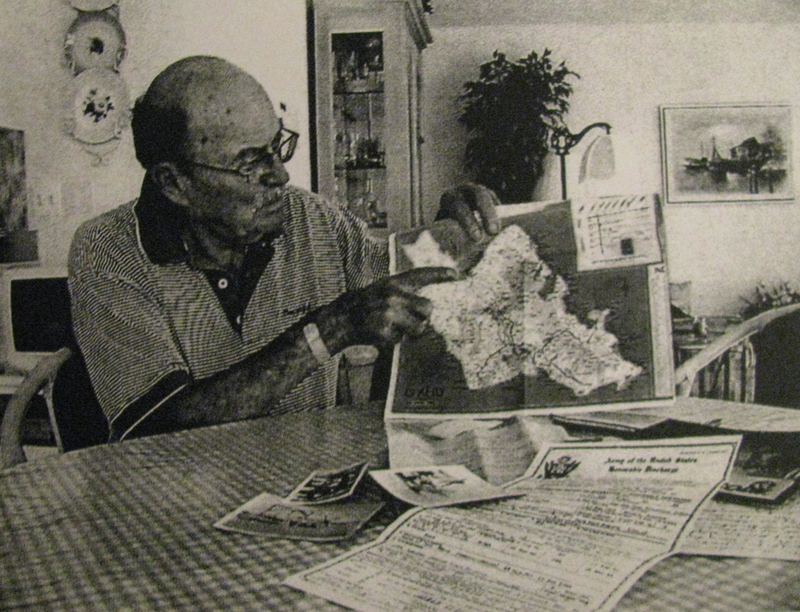 Mr. Sherfick was a long time resident of Indianapolis, Indiana before retiring to Heritage Lake, Indiana and subsequently moving to Punta Gorda, Florida where he has lived for the last 14 years. He was a Veteran of WWII serving in the U.S. Army Air Corps principally with the 47th Fighter Squadron in the Pacific theater. He was employed for many years at Chrysler Corporation in Indianapolis working at both Chrysler’s Shadeland Avenue Plant and the Chrysler Foundry in Indianapolis, Indiana. Mr. Sherfick was a member of the Murat Shriners of Indianapolis, Indiana, the Southport Masonic Lodge 270, and he attended New Day Christian Church, Port Charlotte, Florida. Always an avid golfer, good guy, and a great Dad, he will be missed. Funeral services will be held July 21, 2008 at 11:00 a.m. at the Kays-Ponger Funeral Home, Port Charlotte, FL. A separate memorial service will be held Saturday July 26, 2008 at 11:00 a.m at the Shoals Christian Church, 602 Main Street in Shoals, Indiana. Inurnment is to be done in private in Indianapolis, Indiana. A note to friends: at your option, in lieu of sending flower friends please feel welcome to direct donations to the New Day Christian Church, Port Charlotte, Florida or any cancer medical research or treatment charity of your choice. This story was first published in the Charlotte Sun newspaper, Port Charlotte, Fla. on Monday, January 8, 2006 and is republished with permission. Tremendous story. What an amazing group of men and women that served our country during WWII. Thank you!